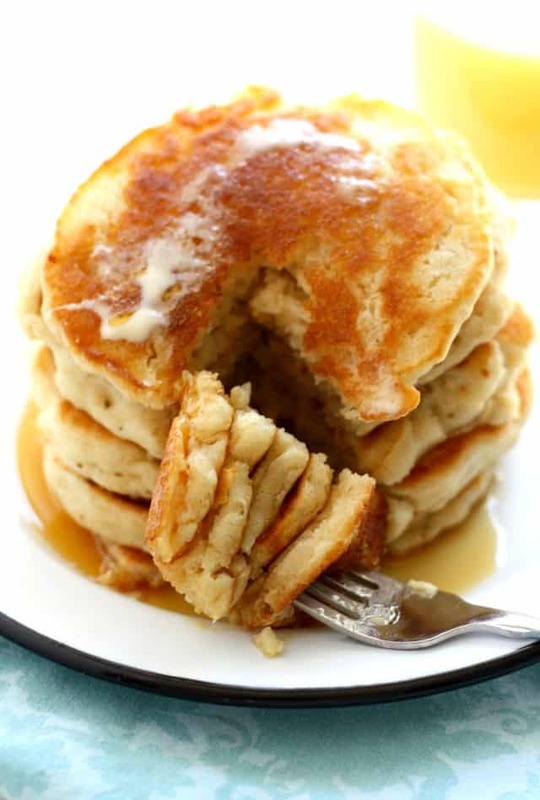 Home » Breakfast » Light and Fluffy Vegan Pancakes. What’s your idea of a perfect weekend breakfast? For many people, a stack of pancakes with maple syrup is just the thing to start the weekend off right. To be honest, it took awhile for me to find a good way to make vegan pancakes. When we eliminated eggs and dairy from our diet, I knew that we would have to make some substitutions. Yes, they can! Vegans can eat pancakes made without dairy and eggs. You might wonder if it’s possible to make delicious vegan pancakes. Thankfully, it is indeed possible, and if you look at the comments below, you will see that many people (myself included), love these more than traditional pancakes. I started with this recipe, and I’ve adapted it to suit our tastes. We like our pancakes to be nice and fluffy and a little bit sweet. 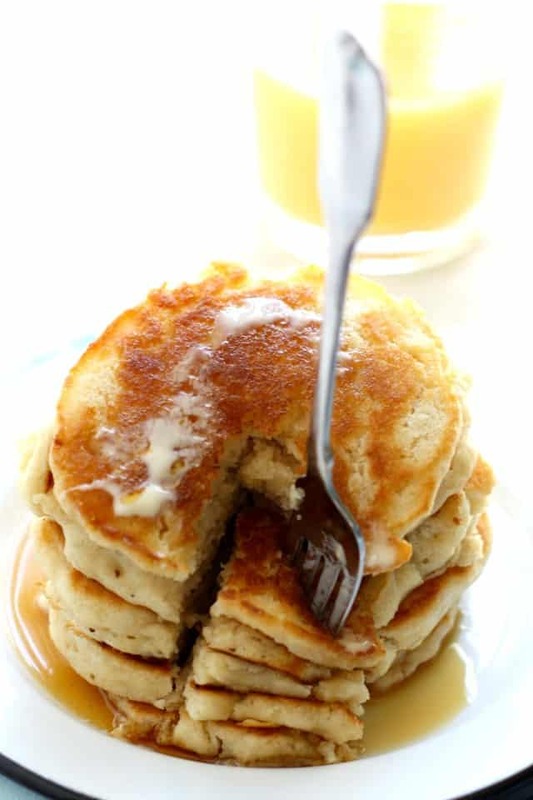 You can add some fruit to the batter if you wish, but our favorite way to enjoy these light and fluffy pancakes is with vegan buttery spread and lots of maple syrup. Once you master this classic recipe, you may like to try my fluffy vegan banana pancakes and my vegan pumpkin chocolate chip pancakes. How do you make vegan pancakes without milk or eggs? I was so used to making pancakes or waffles with eggs, and it took some experimenting for me to be able to make them egg free. However, the process is pretty much the same as the traditional recipe. You’ll use flour, salt, baking powder, a little sugar, some oil, and of course your favorite non-dairy milk. These dairy free and egg free pancakes are made in one bow, so you don’t have to worry about a big mess to clean up. How do you make vegan pancakes fluffy? The secret ingredient is baking powder! 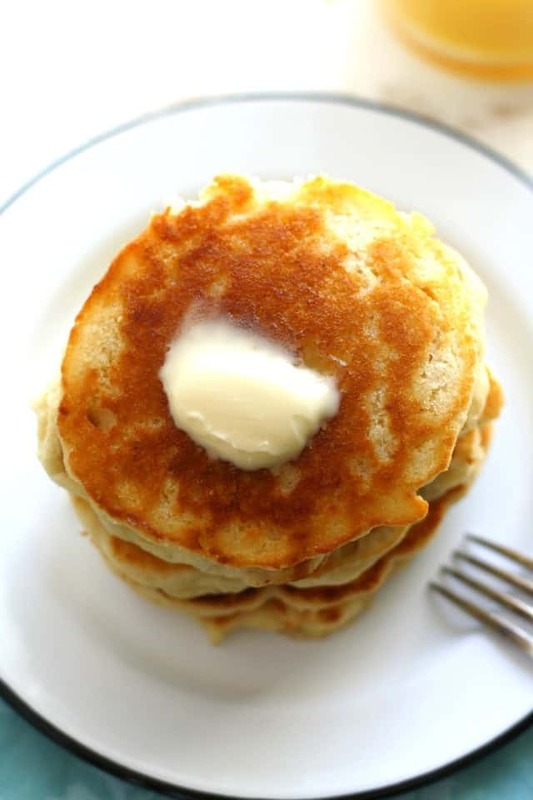 The baking powder causes the pancake batter to rise and produces perfectly fluffy and tender vegan pancakes. The amount of baking powder in the recipe is correct. It looks like a lot, but since this recipe is made without eggs, you do need that large amount of baking powder to make these vegan pancakes rise. Can you make vegan pancakes without oil? 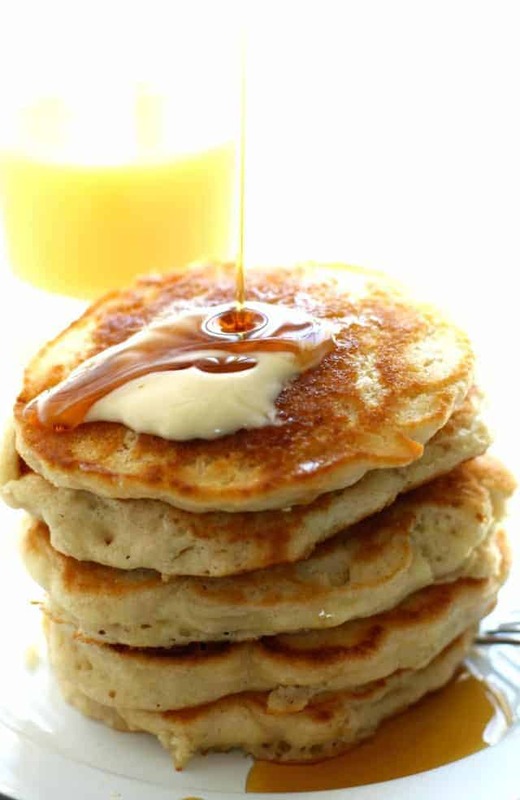 If you want to try to make these pancakes oil-free, try using applesauce instead of oil. The texture may not be quite as fluffy, but the recipe will still work. Let the batter rise for at least 5 minutes. The baking powder needs a few minutes to do its job. And yes, the amount of baking powder required is indeed 1 1/2 Tablespoons. It sounds like a lot, but it’s necessary, and is the key to super fluffy pancakes. Don’t turn the heat too high! Medium heat will do it. Don’t flip them too quickly. It will take about 5 minutes for the bottom to cook through. Look for the edges to be cooked, and a few bubbles to form in the batter. Then flip and finish cooking. A simple vegan pancake recipe that's perfect for weekend breakfasts! These are so light and fluffy and are perfect topped with fresh fruit! Add wet ingredients, and let rise for about five minutes. Melt a tablespoon of vegan buttery spread in a large frying pan over medium heat (I have an electric stove and put the burner at about 5). Spoon the batter into the pan, and cook until you see the edges starting to turn golden brown (about 5 minutes or so). Flip pancakes and continue to cook until done, about 3 more minutes. Serve with vegan buttery spread and syrup, or desired fruit topping. Yes, the amount of baking powder is 1 1/2 TABLESPOONS. Nutrition information is for one pancake. This recipe makes 8 pancakes. If you’re looking for more dairy free breakfast ideas, try my light and fluffy vegan waffles with blueberry sauce. « Gluten Free German Chocolate Cake (Dairy Free, Vegan). The batter is VERY THICK, is this normal? It should still be spoonable…if it isn’t add a bit more liquid. I have the same pan but these cakes stuck and crumbled when I tried turning them. When I added milk it rose immediately… Any ideas? It should rise immediately when you add liquid, so that sounds right. I am wondering if maybe you needed more buttery spread to grease the pan. Yay, so glad you liked them! Thanks for letting me know! These were so good! My kids gobbled them up! Yay, so happy to hear that! Thank you for letting me know! These were incredible! My mom and I made them this morning and they were so light and airy. I prefer these to any non-began pancakes I’ve ever made! Hi, will using regular white sugar make a difference? How many pancakes equal one serving? We love these pancakes! I make them with unsweetened coconut milk from a carton. Do you have any thoughts on how they would turn out using canned coconut milk? I haven’t tried that, but I think they would be richer and have a strong coconut flavor. Yes, canned coconut milk or cream does have a really strong taste. I do use unsweetened coconut milk beverage from So Delicious and find it is a neutral flavor. Just like non-vegan pancakes! Delicious! How many pancakes is a serving? And what size should they be? One large pancake or two small ones, depending on how you make them. Hello, I was wondering if you could tell me does te serving that has 174 calories include all 8 pancakes or one pancake has 174 calorues? serving for your recipe? Would be helpful. Also, what is a lower fat alternative to canola oil? I’ve used bananas as that gooey-binder in most pancake recipes over the years but they don’t rise and I’m guessing this ingredient is to blame. A serving would be two small pancakes, or one large one. This recipe does need oil, so I don’t have an alternative. Coconut oil would work, but it isn’t low fat. Thanks so much for this recipe! My daughter has a bunch of food allergies and has never been a breakfast person. We made these last weekend and she’s eaten them almost everyday since. Such an easy recipe with ingredients that I already have on hand. Yay, so glad to hear that, thanks for letting me know! Coconut or brown rice flour okay? These are so great! My daughter is allergic to dairy and eggs, so I am always trying new vegan pancake recipes and this one has been the best one so far! Can’t wait to change things up by adding blueberries, strawberries, chocolate chips, etc. Thanks again! I just tried them and they are wonderful! I used whole wheat flour and I didn’t had to change anything. I added some cinnamon and vanilla – really amazed by this easy recipe…and I’m one that can mess up the easiest recipe possible! Glad you liked them! Thank you for letting me know! I have 30+ food allergies. They are all new to me. I am always trying to find a recipe that tastes like “normal” food. I give these 5 ⭐️?⭐️?⭐️. These make the BEST pancakes. I used almond milk and coconut oil. Added real vanilla and wild blueberries. Turned out so fluffy, light and beautiful. Better than even my old pancake recipe. Please try and prettybee, thank-you so much for this recipe. So glad you like these! We love them here, too! I love these pancakes. I make every other weekend and generally use almond milk. Thanks for this recipe! Best vegan pancake by far! Made this recipe today and the pancakes were so delicious!!! I followed the recipe and I used all purpose flour, vanilla almond milk, and coconut oil. Deeeellliisshh!!! Thank you!!! How much butter do I put in the pan for pancakes? Sorry, but I never make pancakes. Thanks for the recipe. I would do about 2 tablespoons. So freaking good. I always come back to this recipe. I’m about to make some for me and my hubby right now. Happy to hear that you love it! Thanks for letting me know! This is THE best vegan pancake! I have made so many recipes and they are never quite right. Thank you so much for this!!!! Our weekend mornings (and some weekday dinners) are now complete!!!! ? Yay! So glad you love them! Thank you for letting me know! Just made those now ! Omg they are really tasty so fluffy and ( most importantly to me ) cooks really well from the inside for a vegan recipe or even a regular one . Yay! So glad you liked them, thank you for letting me know! This looks amazing! But I wondering if u could substitute vegan butter with coconut oil? I think that would work, but I haven’t tried it. Let me know if you do! Yes, you can. Butter works well. Thanks for this recipe, they were sooo good and fluffy. I have lost count how many times I’ve made these pancakes! These are by far the best vegan pancakes I’ve ever had. Thank you for the wonderful recipe! So glad you like these! They are our favorite as well. Thanks for letting me know! These pancakes are LEGIT!! Thank you so much for publishing a pancake recipe that actually tastes good! I have only recently found out that I’m allergic to dairy and egg whites, so somewhat-vegan eating is new to me (and my family, since they eat what I eat!). I’ve tried several terrible pancake recipes. This one, though, is awesome. Many thanks, and you have a new follower! Oh! But I just found out th ebaking powder was already opened prior.. so I’m guessing that is what caused them to be flat? Could be older baking powder, that can be an issue! It could be the GF flour. I have made these with GF flour, and they did rise, but not as high as with the spelt flour. 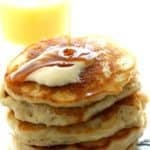 I have tried A LOT of vegan pancake recipes for my husband over the years (I’m not much of a pancake fan myself) and these are easily the BEST! Even I love them! I had to make a few subs based on what I had, but I don’t think they altered the end result: all purpose flour, coconut sugar, and melted earth balance instead of canola oil. So glad you love them! Thanks for sharing! Will whole spelt flour work? Do these pancakes have that weird aftertaste of baking soda. Because I’m trying to find one that doesn’t. They contain baking powder, not soda, but I do not have any aftertaste when I make them. I’ve been looking for a pancake recipe for a while that’s vegan. As a kid, my dad would always make me pancakes and since going vegan I haven’t had any. These are so good, light and fluffy just like his. Thank you so much for this awesome recipe! Can you have nuts or coconut? What about eggs? I’m trying to think of something that would work for you! I have a Nutri-Bullet, but a food processor or blender would probably work out fine. I go to Walmart and get the big Old Fashioned Oatmeal. I pulse it in the Nutri – Bullet until it has a flour like consistency. It is gluten free and so much cheaper than those other gluten flour you can buy. I have bought several kinds, almond, coconut, etc, but much prefer the flavor of the oat flour. Store in a plastic air tight container. Do you break down the % of items, on Weight watchers would like to be able to count points. BLESS this pancake recipe! I can’t tell you how many ingredients I’ve wasted with vegan raw in the middle, crappy tasting pancakes! I always end up changing the recipe too to use gf flour and it never works! Yay! I’m so happy that these worked out for you! THanks for sharing! Try Namaste brand Gluten free all purpose flour. Costco carries it. Hi there, to make them gluten free I use white rice flour, brown rice milk and frozen cranberries and they turn out incredible. in fact, I’m eating some right now! I use white rice flour for all my baking, its the best! Yay, so glad to know that worked for you! These were great! Appreciate the tip about letting the batter rest before cooking the pancakes–it made a huge difference in the lightness and airiness. I added some cinnamon, nutmeg and vanilla extract to the batter and used 1 cup white whole wheat flour and 1/2 cup all purpose, so I did have to add a couple tablespoons of water. Will definitely use this recipe again. Hi! Is the batter supposed to be really thick? It’s not like your typical pancake batter – mine is almost like dough. I’ve never made vegan pancakes before – is that normal? I did use half gluten free all purpose flour and half coconut flour, maybe that’s why? Thanks! Coconut flour is a really dense flour, so that would make it too thick. Next time try more liquid to make it more pourable. Yay! So glad you liked them, thanks for letting me know! This is the best pancake mix I have tried. I loved the simplicity and texture of the pancakes. Thank you much! That’s great, Amy! Thanks for letting me know! These look so fluffy and pillowy! I love pancakes with fresh fruit too. We are very wintery here also….cold…so cold. Your little yummy treat looks so good! I may have to take a little trip over to the market for berries tomorrow.